Everyone loses stuff. If you’re anybody, it might be a good idea to visit the lost and found. Go into the building and down the echoing stairwell next to the bathrooms. Down a flight, there’s a big brown chest, stuffed in the corner under the stairs. It’s filled with all sorts of things. There may be things of yours, and things belonging to your friends. Looking closer, one would find all sorts of junk that has been sitting there rotting for years (like a lunchbox from who-knows- when with a moldy sandwich inside). 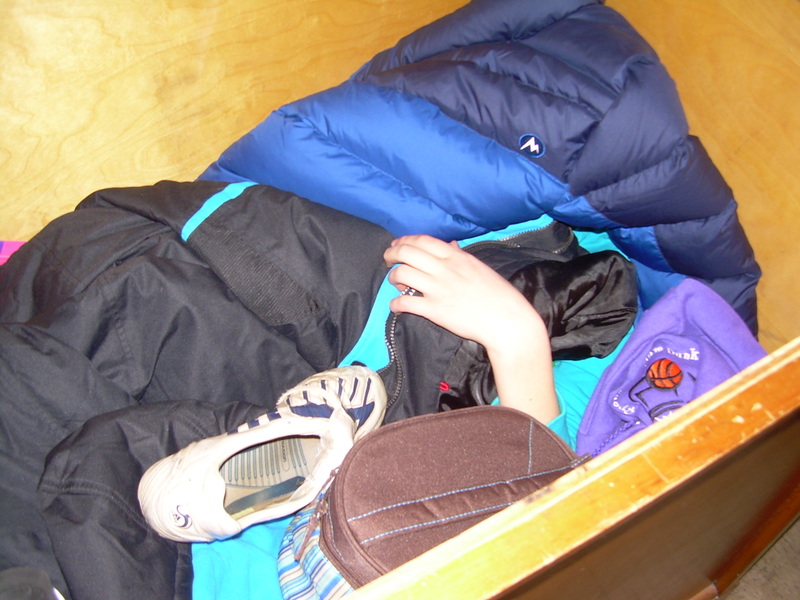 In lower school, the lost and found in the Cary Building is always filled with gloves, coats, lunch boxes, and maybe a shoe. But, every 6 months or so, the lost and found items are put on display in the Cary Building lobby for a week or two so the kids that never bother to look in the lost and found can find their lost items. Then, all the remaining things are taken and donated to a charity and the lost and found is empty, though not for long. The Middle School doesn’t have that kind of system. Middle School faculty expects kids to be more responsible. Or maybe everyone is just too lazy. Either way, that box is never emptied. If the lightweight lid of the chest is pushed open and propped carefully against the wall behind it, an unpleasant stench will waft up. Scrunching up one’s nose, one might push through the junk, hoping to recognize something of theirs in the dim light. There’s a notebook on top of a pile of coats. “Joi Dallas, 2007-2008”. The notebook is filled with English notes from Will “Terri’s” 7th grade English class. Though the notes mean nothing to her now, one can’t help wondering; was is it lost before or after the end of the year? Along with the notebook is all of her 7th grade science work, including a test that the 7th graders just took. A medium-sized Sure deodorant labeled with somebody’s name (who preferred to not have his name mentioned) sits near a ruined Santa hat. If the piles of sweatshirts had faces then they would have long, graying beards. The lost and found is really just the found, because no one knows what they’ve lost. “He-who-shall-not-be-named” probably has new deodorant, and it’s most likely that Joi Dallas doesn’t need her 7th grade work anymore. It would be nice if the so-called lost and found didn’t smell like rotting lunches and mildewy winter coats, so please take a minute out of your day, and find what needs to be found.